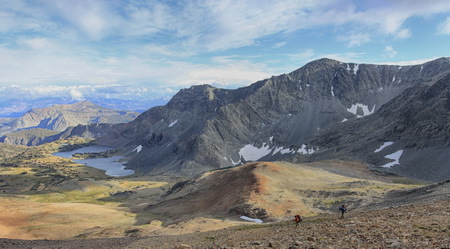 Wilderness offers opportunities for solitude, challenge and inspiration and attracts recreationists to remote communities where visitor expenditures enhance local income and job growth. Snapshot : Forest Service scientists Tom Holmes and Eric White collaborated with Evan Hjerpe of the Conservation Economics Institute to estimate the economic benefits to rural communities that serve as gateways to U.S. wilderness areas. Their research shows that nearly 10 million people per year visit wilderness areas and spend about $500 million in adjacent communities. Annual visitor expenditures generate about 5,700 jobs, resulting in over $700 million in total economic output. Holmes, Thomas P. White, Eric M.
Wilderness areas attract millions of tourists who spend significant amounts of money in nearby communities, according to new Forest Service research. Because wilderness areas are typically located in the most remote and inaccessible regions, income and jobs resulting from visitor spending contributes to local economies that may have limited alternatives for economic growth. New Forest Service research shows that nearly 10 million people per year visit wilderness areas and spend about $500 million in adjacent communities. Annual visitor expenditures generate about 5,700 jobs, resulting in more than $700 million in total economic output. Maintaining the character and ecological health of wilderness areas are key management goals and, because of the relative permanence of this land use, wilderness areas support the economic sustainability of rural areas.